Apparently last week I said I’d do some world building this week. Well, thanks to that, I actually had to do some seeing that I said I’d tell you about it today! In my Camp NaNo Project, Flightless, the world is actually somewhat important to the general plot line. *gasps* Mostly seeing that the whole issue is entirely political. (The two countries don’t get along, and neither do their guardians/protectors.) 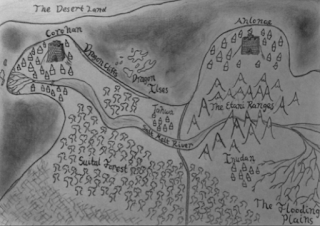 It is also the first fantasy world that I’ve made with logical geography. *grimaces at the memories of my previous attempts* So, may I now present to you, the land of Caldor!!! Caldor is actually a fairly large world, but I’ve only mapped out a little snippet, and the story doesn’t even use up half of that snippet. (Excluding right at the end where it goes off the drawn map, but y’know.) Don’t worry though, all that I’ve drawn does play a role, (people from different places and produce and assassins and things like that) so hopefully it isn’t just a waste of paper. This is where Caution comes from. The people on this side of the kingdom are protected by the great dragons. (Or at least, that’s what the legends say) And seeing that dragons do seem to come into it a fair bit, I think those legends were fairly accurate. The Royal Family is designated by birth, and they are very traditional. The origin of the family stretches back to way before the story begins, when Corohan, a dragon, blessed a man with intentions that were for the good of the kingdom with a magical gift to be able to heal. The land flourished under his rule, and since then, whenever a new member was crowned, they too could petition for a gift. Somewhere along the line, the royal family started to gain gifts before they held the throne. They also chose the name themselves after different virtues as a reminder of who they needed to be in order for the country to thrive. And that brings us to the current royal family of Corohan! His magical gift is that he can control the tides. This has made sea attacks virtually impossible, and has made trading smooth and the fishing industry is doing very well. His blessing it that he has the ability to silence words. This makes him quite an adapt diplomat as he can ensure that he gets his say, and can stop rumours very adequately. She has no fancy magical gifts seeing that she is neither ruling, or part of the bloodline. Marrying in does not score her a magical gift. *pats her* And her husband picked out her name. Our main character! Her gift is that she can grown wings and fly. This has also meant that she has become quite good at sewing and altering her clothes to account for the wings. His gift is that he can make things glow. Or just project light. This comes in handy during the book, even though he’s somewhat jealous of his older sister’s wings. I have baaaaasically nothing. *hides* I’ll do my best though. They have the Etani as their equivalent to the dragons. They’re basically these big bear things that can move with decent speed and are known to grant wishes. The Royal family? Uh, I have a bit seeing that they do come into the story. Tane is his youngest son. He’s betrothed to Caution. He has elder siblings. I just don’t know them. Anyone else? Who else has only built half of their world with only a few hours left??? Eeeep! Thanks so much for your enthusiasm MEM! *pats* What I've seen of it looks awesome!